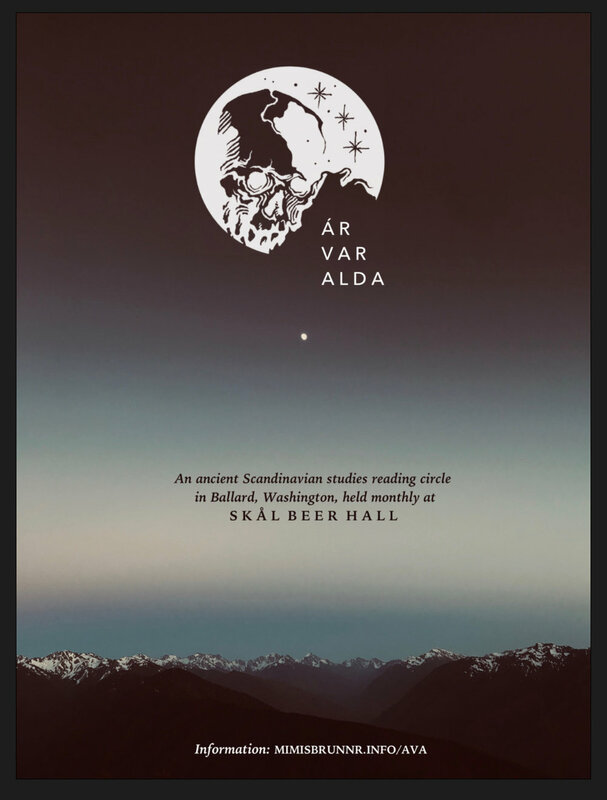 Ár Var Alda (ÁVA) is an ancient Scandinavian text reading circle that meets on the final Wednesday of every month at Skål Beer Hall in Seattle, Washington's historic Ballard neighborhood. All reading is done at the meeting, and all reading is performed in English. While you’re welcome to bring your own translations, ÁVA also provides materials. ÁVA is free, but we do ask that you patronize our friends at Skål Beer Hall to thank them for sharing their space with us. All are welcome! ﻿Like previous incarnations of ÁVA, Mimisbrunnr.info administrator Joseph S. Hopkins organizes and leads the reading circle. ÁVA publishes updates here and on Mimisbrunnr.info’s otherwise rarely used Instagram (@mimisbrunnr.info). In Vǫluspá, an undead vǫlva (a pagan Norse seeress) tells the wisdom-seeking god Odin what has been and what will be, including the primordial dissection of the enormous being Ymir, the endless reach of the cosmic tree Yggdrasill, and the creation of mankind from driftwood by three gods—all topics discussed in past and future ÁVA sessions. Ar Var Alda’s 2019 flyer, featuring a photo of the Olympic Mountains (Hurricane Ridge) by Joseph S. Hopkins. and from ymir’s blood, the sea. The image consists of three elements: a skull, three large stars, and nine smaller points of light. The skull represents that of Ymir, which the gods formed into the heavens. Representing the three deities who dissected Ymir (the three brothers Odin, Vili, and Vé). Like three, the number nine occurs frequently in Norse mythology (three thrice). Like Mimisbrunnr.info’s logo, the Red Boar’s Daughter rendered ÁVA’s Ymir logo. Have a look at her website to see more of her excellent work! The first incarnation of ÁVA (then Ár Var Alda: The Ancient Germanic Studies Society at UGA) met from January 2012 until June 2015. ÁVA gathered the second week of every month, generally in Joseph "Joe" E. Brown Hall on the University of Georgia campus but also in various cafes and bars throughout the Athens, Georgia area. While primarily aimed at students, ÁVA welcomed all. The group held all meetings in English and provided all necessary materials. 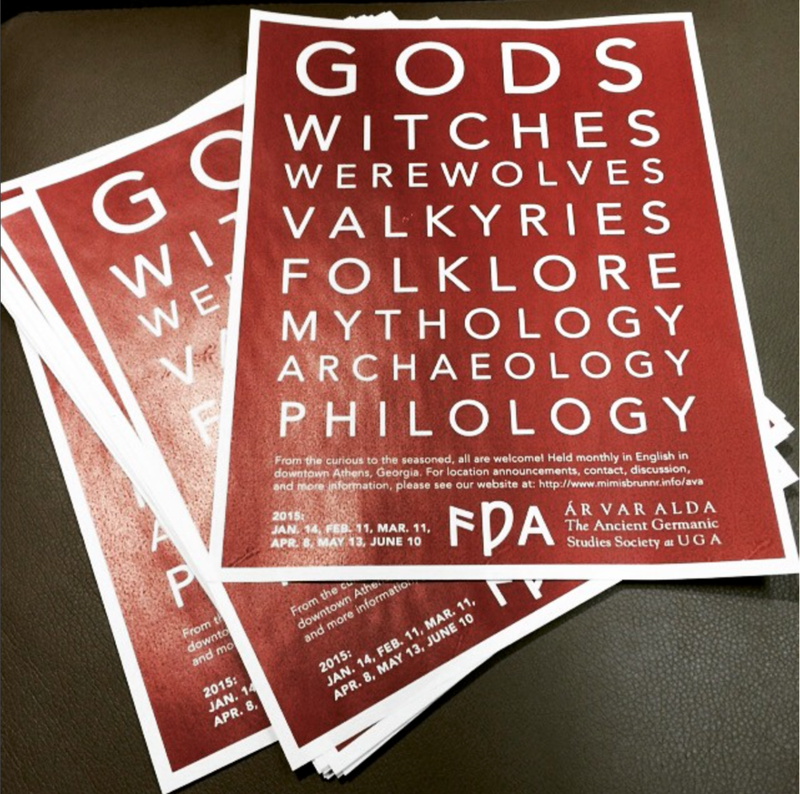 At ÁVA meetings, members read aloud and discussed English translations of texts originally composed in Old English, Old Norse, Old High German, and an array of related languages. While AVÁ primarily focused on ancient texts, the group frequently touched on modern folklore and modern popular culture. Joseph S. Hopkins and Geoffrey Adams, at the time both students at UGA, founded ÁVA. The group was sponsored by Alex Sager, then-Associate Professor of German at the Department of Germanic Slavic Studies at the University of Georgia. You can read an interview with Sager as part of Mimisbrunnr.info's Six Questions feature here. In use from 2012 to 2015, ÁVA's original logo displayed something of a brief history of the English language. The logo consisted of the initials ÁVA from three different periods. Á appears represented with the Elder Futhark rune *ansuz meaning '(a) god' occurring during the Proto-Germanic period, V appears represented with the Old English and Middle English character wynn (descendant of Elder Futhark *wunjo), and the final A appears as we'd see it today.